Punto de Contacto-Point of Contact (POC) in the College of Arts and Sciences (A&S) celebrates National Poetry Month with a joint reading by Pulitzer Prize-winning poet Peter Balakian and up-and-comer Lauren Sanderson. The duo will read and discuss their work on Thursday, April 18, at 6 p.m. at the POC Gallery, located on the ground floor of the Nancy Cantor Warehouse, 350 W. Fayette St., Syracuse. Free and open to the public, the event is part of POC’s “Cruel April” poetry series. For a complete schedule, visit puntopoint.org/cruel-april. 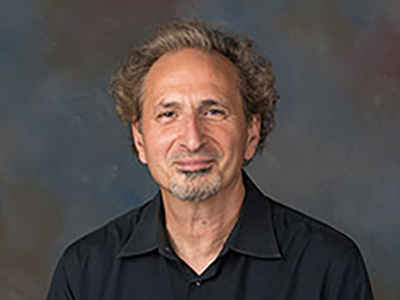 Balakian is the author of seven books of poems, notably “Ozone Journal” (The University of Chicago Press, 2015), winner of the 2016 Pulitzer Prize for Poetry. The Armenian-American poet also is the author of two memoirs and has had his work translated into more than a dozen languages. Based at Colgate University, he is the Donald M. and Constance H. Rebar Professor of the Humanities in the Department of English. Sanderson also has ties to Colgate, where she earned a bachelor’s degree last year in English, with a creative writing emphasis. Also a nationally ranked student-athlete, the Ontario (Canada) native makes her literary debut later this year with a volume of poetry titled “Some of the Children Were Listening” (Write Bloody Publishing). 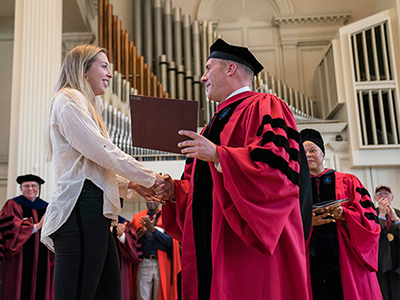 “She [was] an unusual student, one with real leadership qualities who contributed greatly to the intellectual life of the student body,” Balakian says. 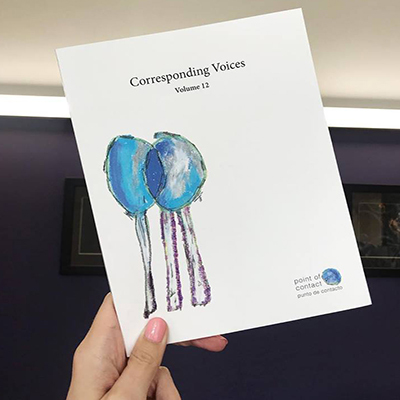 “Cruel April” coincides with the release of the 12th volume of “Corresponding Voices” (POC, 2019). The award-winning poetry collection is co-edited by two A&S colleagues: Jules Gibbs G’12, a poet and part-time instructor in the Department of English, and Tere Paniagua ’82, executive director of the Office of Cultural Engagement for the Hispanic Community and a Spanish instructor in the Department of Languages, Literatures and Linguistics (LLL). In the book’s preface, Gibbs channels the late Pedro Cuperman, the eminent Argentine scholar who founded POC and taught in A&S. “‘Corresponding Voices’ is a continuous, meaningful text, with relatively loosely defined borders, where translation and dialogue with other poets occupies a central role,” Gibbs quotes him as saying. Paniagua agrees, noting the new dimensions that “Corresponding Voices” continues to open, verbally and visually. “I am proud of the way we bring poets from different backgrounds together to form a dialogue. It’s exciting and gratifying,” she says. This year’s volume features poetry and photography by Rachel Eliza Griffiths, as well as cover art by Michael Burkard, a renowned poet and retired associate professor of English in A&S. A&S and the Coalition of Museums and Art Centers at Syracuse University co-sponsor “Cruel April,” with support from LLL and the New York State Council on the Arts.